My love affair with all things Maine started when I was living in Cambridge, MA in the late 80's. 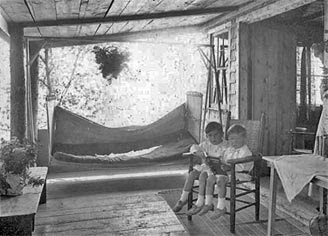 Last summer while on vacation in Stonington, Deer Isle I came across an article about these practical and comfortable porch swings that were a regular feature of the classic Maine cottage. 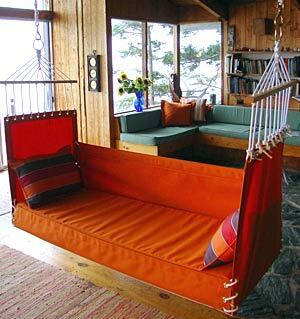 Penobscot Bay Porch Swings has created a colorful and contemporary version of this much loved sailor’s hammock. The owner, Sarah G. Bloy, "first conceived of the idea in May 2001 on a sparkling spring day while on the porch of a classic Maine summer cottage. While chaperoning a 4th Grade field trip she spotted a traditional sailor’s hammock tattered, torn and piled high with rambunctious students enjoying a day away from the classroom. 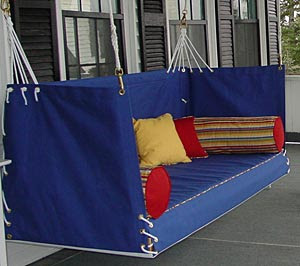 It was by far the most sought after seat on the porch, both by adults and children, and the idea of recreating this beautiful classic was born." 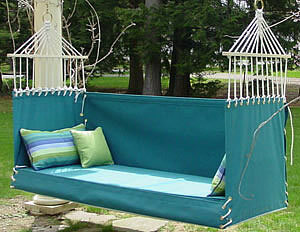 The swings are constructed out of mildew resistant Sunbrella fabric and come in a variety of colors and styles. If you live in the Boston area, you can check them out at the New England Spring Flower show until March 16th. 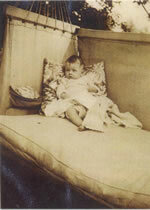 Love the remark on Bloy's web site, "lean back and practice the fine art of leaving things undone!" in austria it's called (translated) Hawaii Swing - weird, no? 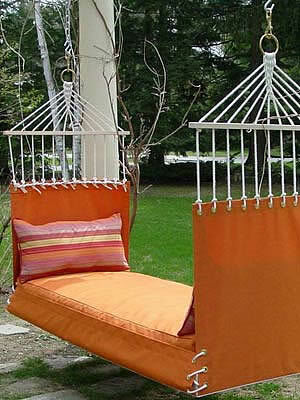 Oh these look so comfy and cool. I've never seen such a swing. Thanks for sharing. I think I need one. Thanks for the idea!